Need front driving / turn signal lenses (two tone or clear), rear lenses, front amber side markers, rear red side markers. All for 1982 GT5. May consider complete units but really only need the lenses. PM me or call my cell at 514-892-9925 anytime if you're interested in either event. Are you replacing all your lenses or just collecting spares? I have some of the rear euro style rear lenses, what sort of condition are you requiring? You saw the clear front lenses on Ebay recently? I'm still trying to replace my worn and cracked lenses with new ones. All those I've seen on ebay have the screws in the center on each side. My screw holes are in the corners. But if you ever see any on ebay again, please advise me! The only other option is to buy all new light units but they are pricey and mine work fine. I just need new lenses. I bought my two tone GT5 front lenses from Larry LF-TP2511 on this board. They are boxed away so I don't know where the screw holes are but he sells them from time to time. You might want to check with him. Yes, I still have them for sale. However, I sell complete sets - housings and lenses. David is just seeking replacement lenses. He and I exchanged emails some months back. Original lenses are found on occasion in Europe eBay listings; David, as did I, found them to be very pricey. Stock Ford front signals came in amber. They were also in clear, in Europe. This style had the holes in the middle on opposite sides. Both colors will interchange to the same housings. The GT5 front lights came in amber/clear. This style does NOT interchange with the Ford style; mounting holes are in opposite corners. To upgrade to this two-color style, you need housings and lenses. 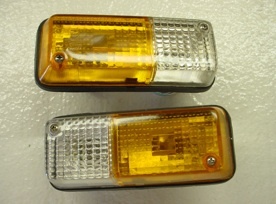 Clear lens becomes a 5 watt running light, the amber is a 21 watt signal light. These are the same wattages, and function, as the stock two-filament bulb. Thanks for the help. I just sent you an email.